Seth Keeton writes, "The wisdom of Emily Dickinson and Walt Whitman is more necessary to America than ever before. Drs. Jamie-Rose Guarrine (soprano), Seth Keeton (bass-baritone), Robert Elfline (piano), and Karl Knapp (cello) present these two unique foundational voices in conversation in a recital of modern American art song by composers Lee Hoiby, Lori Laitman, André Previn, and Ned Rorem, as well as the World Premieres of works by Scott Gendel and Daron Hagen." Bass-baritone, Seth Keeton’s performances have been described by The New York Times as “driven” and “emotionally pointed.” He has performed roles on the stages of The Minnesota Opera, Glimmerglass Opera, Ft. Worth Opera, Central City Opera, Arizona Opera, Indianapolis Opera, Austin Lyric Opera and Opera Omaha, Chautauqua Opera, Mill City Summer Opera, and Theater Bremen in Bremen, Germany. As an oratorio singer, Keeton has appeared in concert as the bass soloist in Mozart's Requiem, Verdi's Requiem, Brahms’ Ein Deutsches Requiem, Bach’s Magnificat and St. Matthew and St. John Passions, Haydn’s Creation, and Beethoven’s 9th Symphony. In 2006, he was a national finalist in the Metropolitan Opera National Council Auditions and has received awards from the Sullivan Foundation and the Eleanor McCollum Competition. In art song and in recital, Keeton’s creative expression takes many forms, and he delights in creating unusual song recitals for himself and his students. He has presented musical experiences in interesting settings such as an outdoor recital celebrating and hosting animals, and an evening of British song in the University of Utah Museum of Fine Arts during a visiting exhibition of British landscape paintings. As a performer he presents tightly knit recitals, singing pieces in unique combination and often including rarely performed works. As a scholar Keeton is working to create an online song index that will make it easy to find related song repertoire. This index will become an essential reference, helping singers and pianists find forgotten song repertoire as well as discover new vocal works. Mr. Keeton received his Doctorate of Musical Arts in Vocal Performance from the University of Minnesota and is an Assistant Professor of Voice at the University of Utah School of Music. He lives in Salt Lake City with his wife, Angie and son, Miles. Daron Hagen writes, "Adulthood comes soon enough. After three decades as a Manhattanite, my family moved to the country so that my young sons could feel the earth between their toes and enjoy, as I did as a child, a few endless, golden summers during which their parents seemed to be immortal and every good thing felt as though it would remain forever the same. 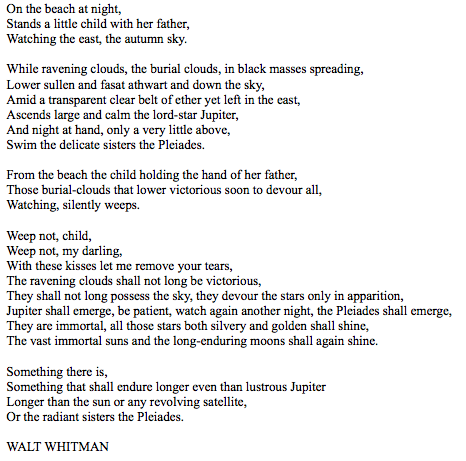 These thoughts, and the troubled state of our nation today, were in my mind when I turned to Whitman's great scena for father and child On the Beach at Night. "The baritone's heart and mind are split between the cello and the voice in this scena, with the piano playing the role of omniscient observer and rueful commentator. The harmonic language istonally ambiguous, chromatic vacillation from one extended harmony to the next as he muses internally. The cello plays his feelings as he encounters them, and then he sings them. As he struggles to explain, perhaps reassure his child, the harmonic and melodic language moves toward the relative tonal simplicity he finds comforting, if still unsettled. "As Whitman wrote, 'the ravening clouds shall not long be victorious.' As fathers, Seth Keeton, commissioner and premiere performer of the scena, and I are engaged in the same struggle for the sake of our children. Every person is, when values are tested and social progress set back. "Seth flew on frigid January afternoon from Utah, where he lives and teaches, to my home in New York, where together we worked through the piece, and I had the great pleasure of customizing it completely to his instrument and personality."